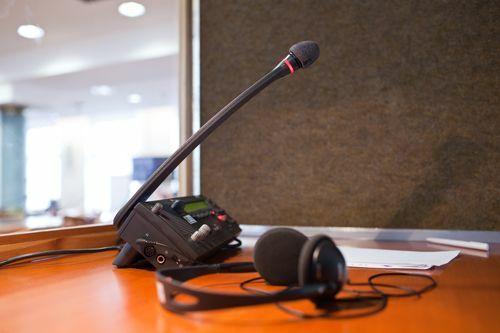 Also called booth interpreting, and is most frequently used during conferences, conventions and lectures for a large audience. This kind of interpreting is carried out by 2 interpreters taking turns every 20 minutes. Interpreting occurs during an utterance. Booth interpreting requires appropriate equipment and technicians. We can translate in virtually any language combination with English, Spanish, French, German, Italian, and Portuguese as source or target languages and virtually any world language, including Chinese, Japanese, Russian, Bulgarian, Czech, Danish, Dutch, English, Estonian, Finnish, Greek, Hungarian, Korean, Latvian, Lithuanian, Norwegian, Polish, Romanian, Serbo-Croatian, Slovak, Slovene, Swedish, Turkish, Ukrainian, Vietnamese, etc. 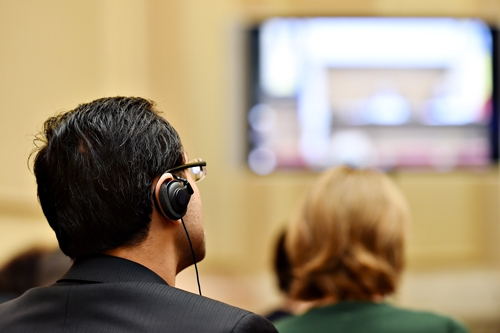 When it comes to interpreting you can only trust the best Settlement for interpreting is effected depending on the language, venue, type, and duration. The most popular unit of settlement is a 3-hour block (for consecutive and whispered interpreting), a 4-hour and 8-hour block (for simultaneous interpreting).